There’s nothing ordinary about a FlashPoint candle. Instead of one wick, FlashPoint candles have multiple wicks. Instead of identical, bland containers, each candle is hand-poured in a stunning ceramic vessel. The founder of the company, Drea Groeschel, set out to create candles that do more than simply give light and freshen the air in your home. Using multiple wicks creates a dynamic landscape of candlelight—it’s like the difference between a single star and a canopy of stars. Drea specifies the proportions of the drip-glazed ceramic pottery to maximize the effect, and she uses blue-hued glazes on the inside surfaces to reflect the shimmering lights. When you want to add instant atmosphere to an indoor or outdoor table setting, Drea’s multi-wick candles cast a warm, inviting spell. 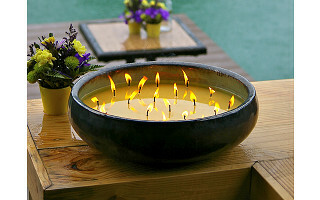 Depending on the size, FlashPoint candles provide between 40 hours and 75 hours of burn time, and you can reuse the ceramic vessel (it makes a great container for floating candles). Each creation is a luminous work of art. 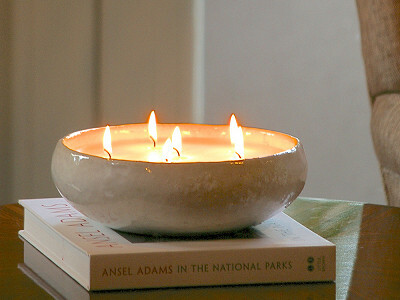 Multi-wick indoor and outdoor candle, Saxon 9", in a reusable ceramic vessel. Hello All! Or should I say “Howdy All” from the country music capitol of the world, Nashville Tennessee. I’m so glad that FlashPoint Candle ceramic vessels were chosen as today’s featured Grommet because Autumn is here and there is no better time to entertain outside and enjoy the fresh Fall air while dining by stylish candlelight. A nightly occurrence at my house! Or spruce up your old fireplace and give it a purpose once again, light up a large FlashPoint Candle inside and Voila!, a cozy romantic evening in front of the fireplace. I also designed each piece to be reusable and last a lifetime, so add a little “bright” to your life and I’m here if you have any questions or other great reuse-recycle-repurpose suggestions! They are beautfiul. Do you produce the pottery yourself as well as pouring the candles? @Betty: So glad you love the candles. Drea will be dropping by soon to answer your question. 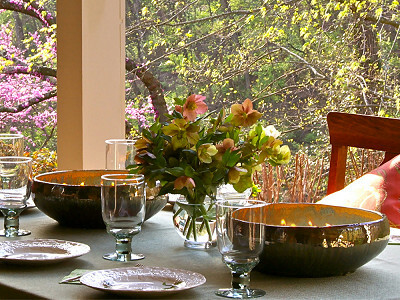 @Betty Hello Betty, We design all the pottery in house and hand pour all the vessels in Ohio! @Betty the pottery is made in china!! I would certainly like to buy one, but they are way to high for my budget! I loved the idea of all the wicks.Maybe one day you will come down on your prices! They are awesome. Thanks. @ Sue Klemann Susan, thanks for the Kudos! We always love to hear when someone likes the design. Yes, they are a premium priced product but with hand made items it's the time spent in the process that is reflected. Thank you again! Wow, these look great but I cannot believe the prices. $200 for a candle? Really?? Could I if I really wanted to? I suppose but I can't imagine I ever would. @ Kate Hello Kate, our pottery is really a good part of the pricing. Hand thrown pottery is always at an artistic premium and the vessel is a true statement piece. @Drea Groeschel Stuff made in China doesn't command a high price. These candles are way overpriced. @ Ali I agree.....crazy high for made in china pottery. @Drea Groeschel handthrewn? artistic premium? Isnt it manufactured in China?! I would really love to buy one but the 9" Oxblood is the one I am interested in but I really don't like fruity scented candles. Is the scent a strong apple or more like a woodsy autumn with a hint of apple? @ Lori Hello Lori, the Apple is very light and crisp. Not heavy but definitely Apple. The details page says that the pottery is actually made for you in China. Chinese manufacturing quality is so uncertain these days; can you give us any assurances about safety? For instance, have you checked that nothing's coming out of the glaze when it's heated by the wax or a flame. @ Muireann Hello Murieann, This is a great question. We take extra careful steps to make sure ALL of our product is safety tested. Every batch, every glaze color, every style and size. We use the strict ASTM guidelines along with all recommended safety standards from the National Candle Association and then we go one step further and have all products third party tested just for back-up. We know that with any overseas manufacturing this is something that has to be dealt with head-on and in our daily routine. I know you won't be disappointed. I'm confused, it said that the wax was poured in Ohio into a container made in China. There's just so much...."wrong" with that statement, at $196 for a ceramic candle, I don't know where to begin. Help me understand? Don't get me wrong, they're attractive, but who can afford a $196 candle? I can't see paying that kind of money for a candle from China. 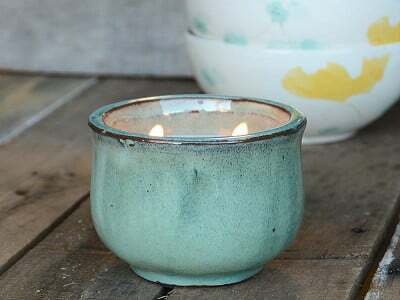 I am a huge fan of hand thrown pottery and agree that it does make it's own statement, but it would be a good deal more valuable to me from artisans here. @ SAMartin, @Muireann, @seriously?, @Ali, and others: Thanks for your thoughts. What a great debate. Reading your comments it is easy to see exactly what kind of contradictory issues a small artisanal company founder like Drea Groeschel faces. Some people here at Grommet would like the product to be less expensive (understandable, especially if they don't value the permanence of the vessel), and others prefer it be made in the USA to support local craft. In this case, those two ideas are probably incompatible. That leaves Drea in a quandry! Coming from Detroit myself, I thoroughly understand the issues around losing domestic manufacturing jobs. But it's kind of refreshing to imagine ancient Chinese craft practices being supported by FlashPoint. We are at risk of losing that in many places, including China. Drea has a tough juggling act in trying to make her products enduring and not throw-away, beautiful yet functional, and reasonably affordable for people who value handcraft and sustainable products. I guarantee this: Drea and other Grommet partners spend countless hours on these sourcing issues and do not make these decisions casually. @Jules Pieri, @ SAMartin, @Muireann, @seriously?, @Ali, and all. Hello Everyone, yes this is a good debate. We have it all the time in my office! There are a few issues in play here that are important to recognize. To make bowls of this size at the volumes that we need for everyone, it simply isn't doable in the USA. I've spoken personally with multiple ceramics manufacturers and artisans here in the States and at this point I have not found an operation that can create my designs at an affordable price. We would be happy to pay more for the ceramics to be made in USA, but to what end? I did get one quote that could not meet the volumes but if we did limited runs, this was 4x higher. So a $199 candle would be closer to $800. This in my opinion is way to high and would not make much sense. If you look at hand thrown pottery on other search engines and farmers markets, you'll notice a mug selling for $35 or a small dish for $45. We provide hand thrown, although not hand thrown by US hands, still hand thrown by very good pottery artisans with great skill level. It's also not just the talent but we have to buy the earth as well. Clay is dug, the operation from getting the clay to the potters is a process too! We have been pushing hard to work all of the pieces that make this unique product into USA based production; hand pouring, wax manufacturing, wick manufacturing, ribbon manufacturing and wick sustainers, all from USA. The ceramics is the only piece I have not been able to have made Stateside. I love the comments and happy to explain in more detail any questions. Thank you for your time! I've had the Daily Grommet send me daily emails for a month or so now. While most of the products I've seen are great, all of the products I've seen are not just over-priced, but incredibly so. Knowing that, I still had to take a look at your candles because I absolutely love candles....I have them everywhere. I saw them, loved them, and promptly cancelled my Daily Grommet email subscription. Pottery made in China - for any reason? Scented wax? The prices listed for your candles aren't the only reason I left the Daily Grommet, but they certainly are what pushed me to finally do it. Just thought you should know. So then tell me.......how much do you pay for one hand thrown pottery vessel made in China vs one made in America? I would like to know what your profit margin is. Then I might decide on whether to pay $200 for one candle. And yes, I understand all about labor costs and other costs involved in manufacturing. I know all about cost accounting. I have seen these in person and they are stunningly beautiful. If it is something you can afford, it would make an ideal gift for someone you are visiting for the holidays. Just wondering what wax you are using for these? Is it make for you also? @ Barbara: It's Premium Soy Blend Wax, made and poured in Ohio. Debate about cost, China, etc. aside, my only comment is that Drea might want to consider a company name change... You always hear that you shouldn't leave candles burning unattended, but it always seemed unlikely that a house fine could REALLY start. That said, my friend lost her home to a candle fire recently. However unlikely that there would actually be a fire, the name "FlashPoint" is still rather an unfortunate one for a candle company as it calls to mind the source of a larger fire! I know changing a company name is costly....but just something to consider! You don't want that subliminal negative association! I, too, think these candles are unique but expensive. I decorate my home with candles and love the "mood" which they create. But $196 for a multi wicked candle which after 75 burning hours is gone is a bit steep!! Have you considered making refill candles at a lesser price so that the beautifully designed vessels can be used again and again? For some consumers, this may lessen the blow of initially spending that much money on a candle! Just a thought! These candles are stunningly beautiful. If it is something you can afford, it would make an ideal gift for someone you are visiting for the holidays this year. I wonder if the bowld can be use for food and if i can will the bowld smell like candle and perfume the food in it? @ graciela, the artist has a number of recommendations for reusing the bowls, but none of them involve using the bowl for food. Sorry. Filling the bowl with water and floating candles in it is one suggestion.